A couple of weeks ago I had the honor of teaching and learning at the American Evaluation Association (AEA) Summer Evaluation Institute in Atlanta, GA. I taught a course entitled “It’s Not the Plan, It’s the Planning: Strategies for Evaluation Plans and Planning.” I’ll write about that course another day. On Sunday June 2, I had the pleasure of taking a full-day pre-institute course from information designer Stephanie Evergreen, called Presenting Data Effectively. Slides are visual supports for the speaker. The speaker is the conveyor of information. People can read 7 times faster than people can speak. We can’t read AND listen well at the same time. We can get in the way of people understanding when we read aloud while they are reading to themselves. Fonts have personalities (who knew?). Logos, if used, do NOT need to go on every slide. It is sufficient to limit them to the first and last slide, and put them on the handout. ONE idea per slide (see Seth Godin’s Atomic Development concept). I brought my own course slides to Stephanie’s workshop for some potential updating. Fortunately, I’d been following Stephanie’s work all along, so my slides were in pretty good shape. There was still much to learn, though! Here’s a simple illustration of some key points. Now, this is more like it! Thanks Stephanie! Ah, I see. Without the context the slides were presented in live, I’m sure you can appreciate they’re a bit confusing at face value. As always, any comments or critiques are very welcome. The next post on my blog is a video about making perfect circles, squares etc in PowerPoint, so please check it out when it’s live (within the next week or so). I’d value your feedback on it. 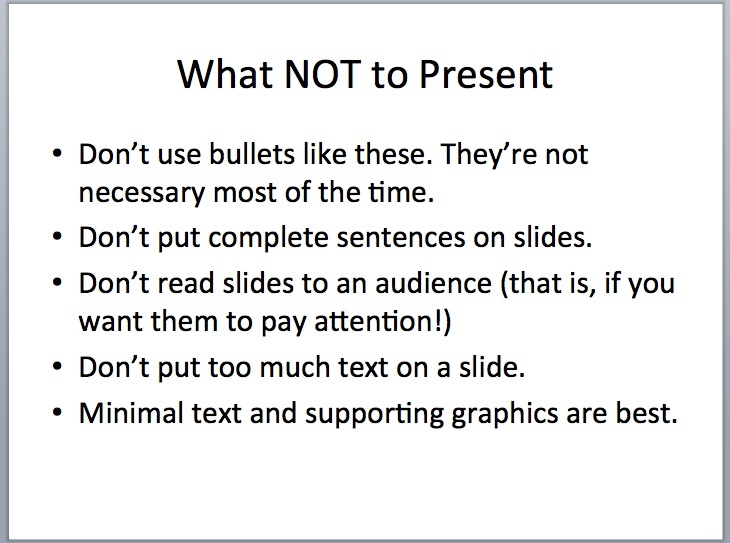 Craig, that slide “what NOT to present” was intended as the “before” slide – an illustration of poor slide design. 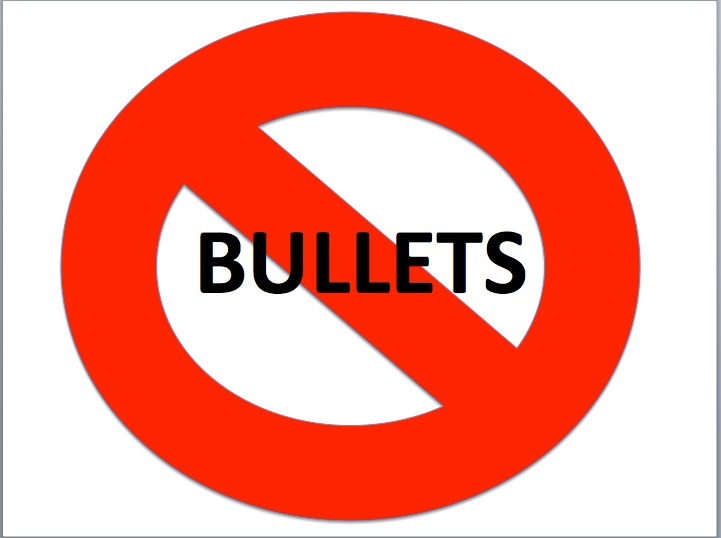 I wasn’t concerned about the red “no bullets” circle being slightly elliptical. While I’m cognizant of stretching images beyond their original aspect ratios, I took a little “artistic license” with the circle. I liked the thick, bold circle (ellipse) and wanted it to stand out a bit more from the text than it would have in a perfect shape. Thanks for your comment and resources. Thanks Sheila. Little did I know about power point presentations! Thanks Stephanie! I can’t believe I followed your work, read your blog, attended your AEA sessions, and there was STILL more to learn! Such important concepts at play here. I appreciate all you’ve contributed to this field. I will post some of my own slides here soon! Great takeaway points, Sheila! And yes, your slides were soooooo close to begin with. In fact, I think you should show them here. Maybe a little before and after? You made small tweaks but sometimes that’s all it takes to go from good to wow.